Watch our video to learn how to make a glorious strawberry cheesecake bowl. 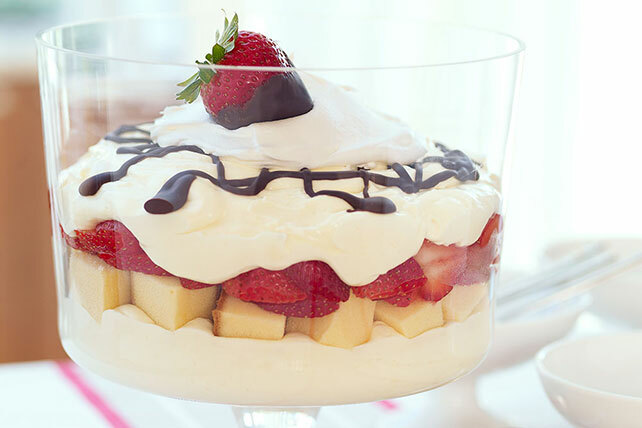 This Layered Strawberry Cheesecake Bowl will be a tasty hit at your party. Combine berries and sugar. Refrigerate until ready to use. Beat Neufchatel in large bowl with mixer until creamy. Gradually beat in milk. Add dry pudding mix; mix well. Blend in 1-1/2 cups COOL WHIP; spoon half into 2-1/2-qt. bowl. Top with cake, berries and remaining Neufchatel mixture. Refrigerate 4 hours. Melt chocolate; drizzle over trifle. Top with remaining COOL WHIP. Garnish with chocolate-covered strawberries just before serving.